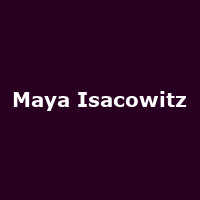 Maya Isacowitz is an Israeli born-South African folk-pop artist. In August 2011 she independently released her debut album, "Safe & Sound", an album which contains elements of soul, blues and country. "Safe & Sound" became Gold Record in Israel and the subsequent tour included over a 150 sold out shows. Maya also won Israel's prestigious ACUM award for "Best New Artist" 2012. Her new album, "All Of The Miles", is due to be released in Europe during 2016.